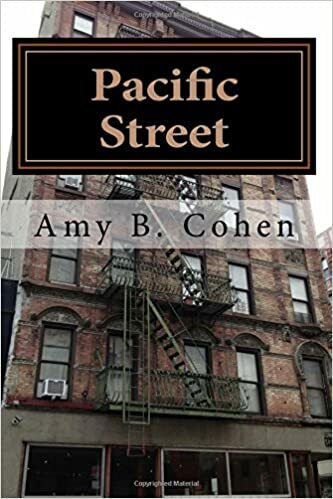 One of the remaining mysteries in our family story was the story of Frieda Brotman, Joseph and Bessie’s third daughter who was born in 1897 in New York, their second child born in the US. Family lore had it that Frieda died in childbirth as a result of a botched delivery by a doctor who was described by Tilly and Gussie as a butcher. That was all I knew about her—not her married name, not her husband’s name, and not her child’s name. In fact, no one knew when she died or whether the baby survived, though we assumed that he or she had not survived. Without the husband’s name, I was sure I’d never be able to find out the answers to those questions. Then I decided that if I searched for all Friedas who were buried at Mt Sinai and Mt Hebron cemeteries between 1920 and 1930, I might find some answers. I picked those dates because Frieda was listed on the 1920 census as living with Bessie and Philip and because I knew she had died by 1930 because my mother Florence was named for her. I focused on Mt Sinai and Mt Hebron because I assumed she would have been buried either where her father was buried or where other family members were later buried. I found two possible Friedas that fit those dates. One did not pan out, but the other was buried in the same section as Bessie. Her name was Coopersmith, and when I searched for other Coopersmiths buried there, I found that there was a one day old baby named Max Coopersmith buried there also in that same section. 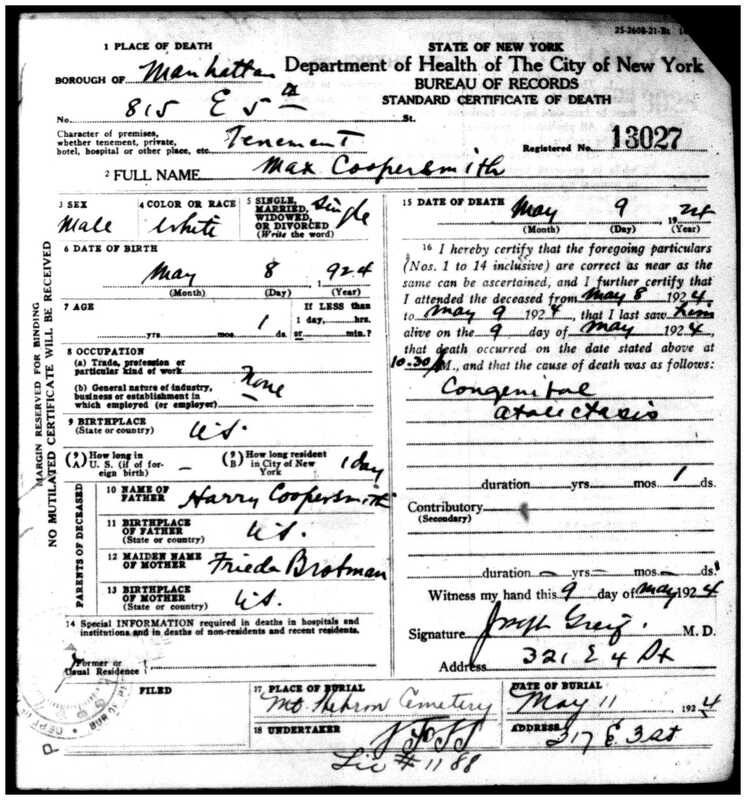 I ordered the death certificates for both Frieda and Max Coopersmith and then waited and waited for the documents to arrive. Well, they arrived the other day, and sure enough, it was our Frieda, as you can see from the death certificate below. The baby Max was her son: parents’ names were Frieda Brotman and Harry Coopersmith. The baby died a day after birth; she died the following day. My heart broke for Harry and for all of her family. My mother said that my grandmother never spoke about Frieda, that it must have been too painful. After all, Gussie and Frieda were only two years apart, much younger than their older siblings, and must have been very close. They were the two girls born in America and must have had different outlooks and experiences than Tilly and their older brothers. I sent the death certificates to my brother Ira, who is a doctor, to get his insights on the causes of death. 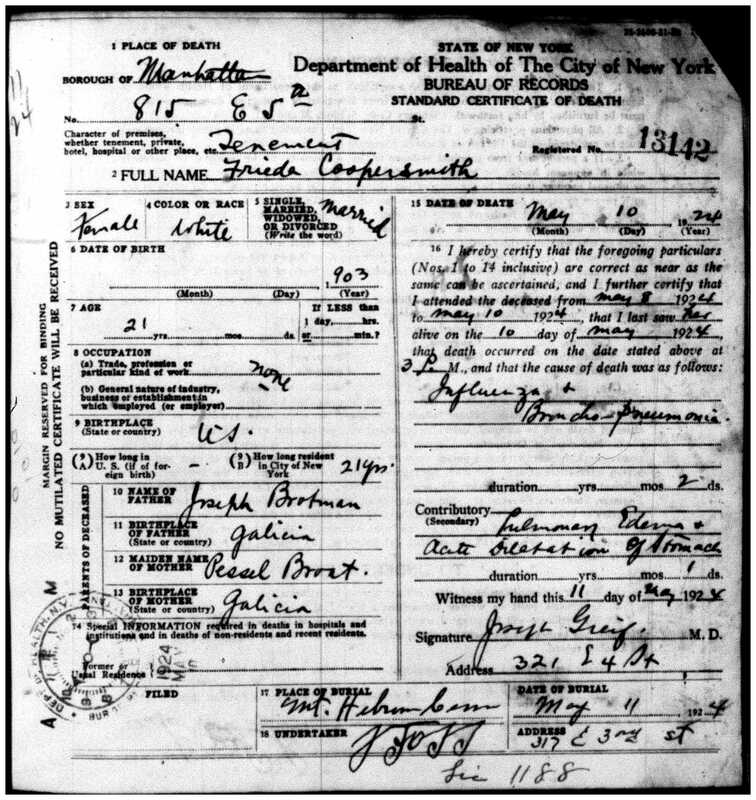 Frieda’s death certificate says that she died of “broncho pneumonia and influenza” with “pulmonary edema and acute dilation of the stomach” as contributing causes. Ira thought that this could mean either that she died of peripartum sepsis or pre-eclampsia based on this combination of symptoms and causes. As for Max, his certificate says that he died of congenital atelectasis, which means his lungs had not expanded sufficiently. Ira thought that might have been caused either by sepsis or by prematurity. In any event Ira concluded that it did not appear that the deaths were caused by malpractice by the doctor. I am now trying to find out more about Harry and his marriage to Frieda, though I am not sure what I will be able to find. But as I’ve learned by doing all this, you just never know what you can find. I never thought I would find Frieda. Now that I have, she is not just a name, but a real person who died far too young with her whole life in front of her. And imagine if Max had lived? How many more Brotman cousins we might have had. This entry was posted in Brotmans, Genealogy, Miscellaneous information and updates and tagged Frieda by Amy. Bookmark the permalink. Unfortunately, I did not know any of this until after the trip to Mt Hebron. I would have liked to have seen Frieda and Max’s headstones. That so cool. I love reading your posts. I find out so much family history, that has been lost for in some cases over 100 years. Keep digging. Wish you had gotten this information before you went to the cemetery. Me, too. Next time! So glad you are reading! !